As much as I want it to be spring already, we still have a few more weeks until the first official day of spring. And, considering that I live in New England, it’s usually a few more weeks after that. 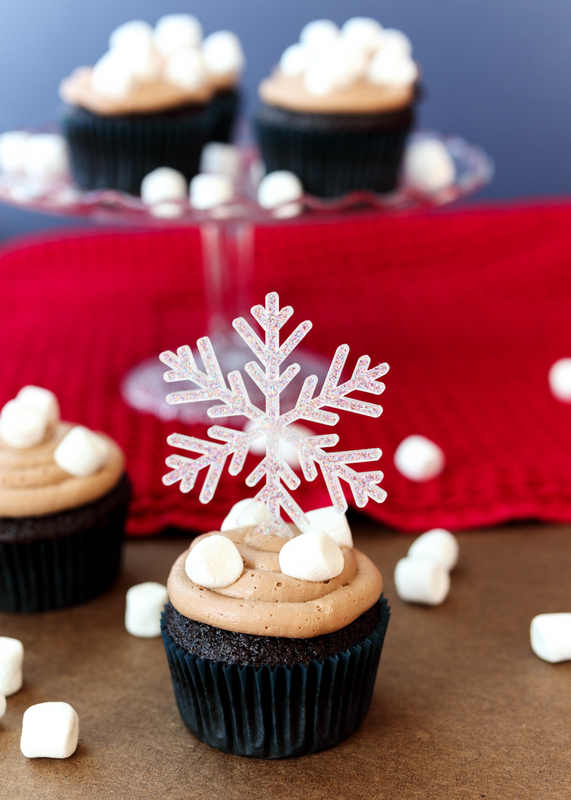 I decided to embrace the last bit of winter that we have left and make these decadent and cozy Hot Chocolate Cupcakes. 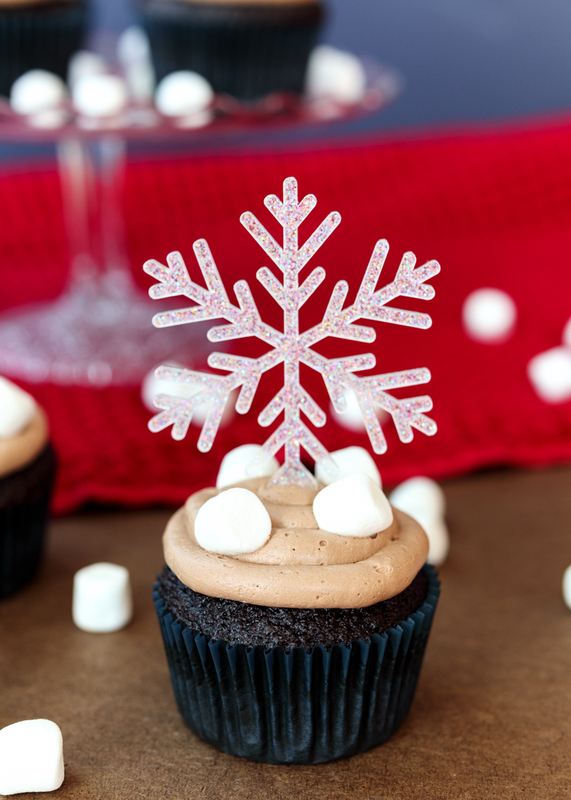 My inspiration for these cupcakes came from these adorable sparkly snowflake toppers! I have the coolest goddaughter who seriously gets my love of baking and cooking. This past fall for my birthday she scoured Etsy to find unique cupcake toppers for each season. 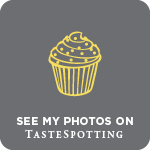 I immediately knew the upcoming year on Lemon & Mocha would have to include four special cupcakes, each showcasing the cute seasonal toppers from my goddaughter. 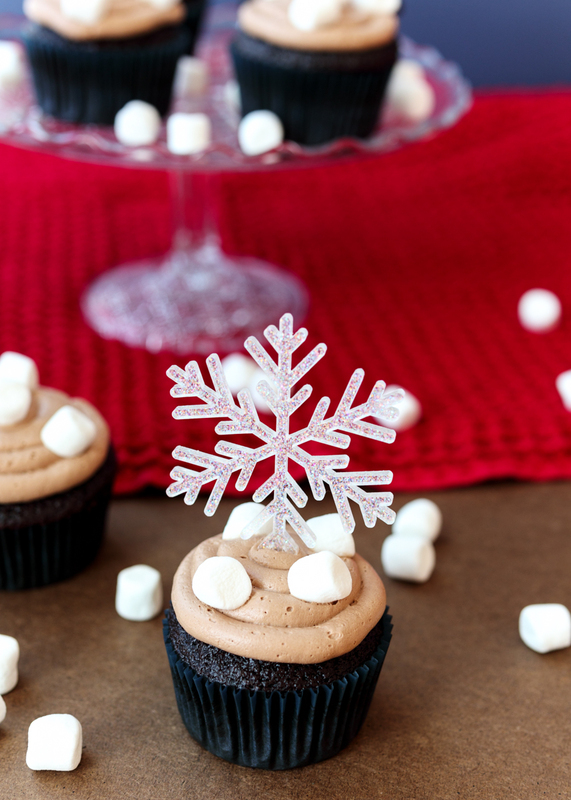 When I was trying to decide what to make for the winter cupcakes I immediately thought of my favorite winter beverage: hot chocolate. The base of these cupcakes is my Perfect Chocolate Cupcakes. 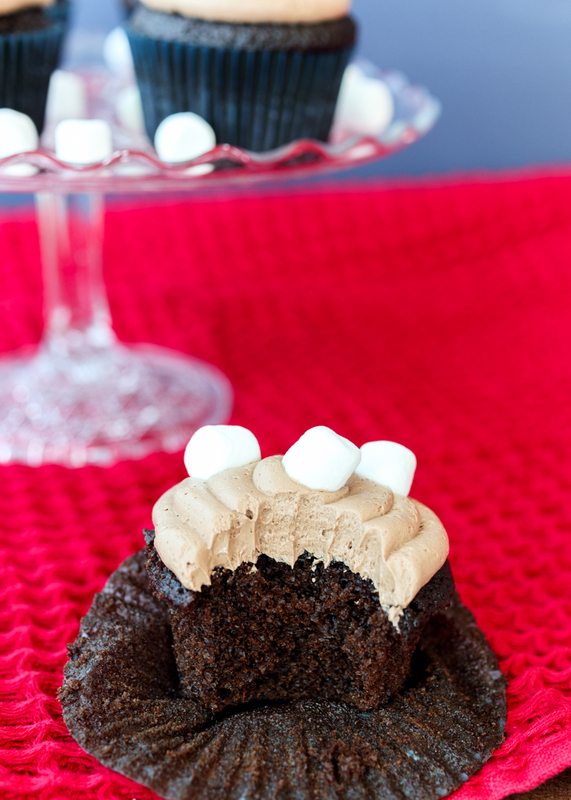 I tweaked the recipe this past fall and they truly are the most moist and light cupcakes with a big chocolate flavor. 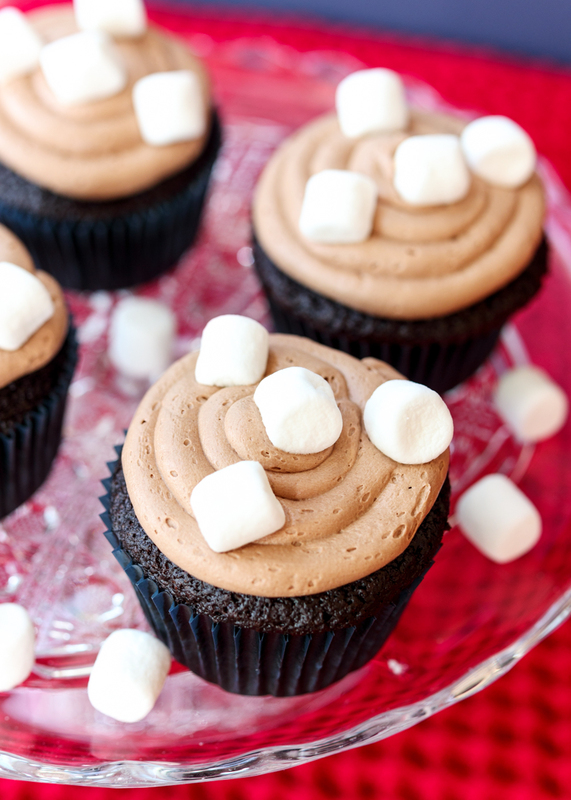 I’ve raved enough about my chocolate cupcakes in the past though so we can move on the frosting, which is what makes these not just chocolate cupcakes, but Hot Chocolate Cupcakes. Let me get right to it; this frosting is crazy good. All it took was one bite to know this hot chocolate frosting would be an immediate member of my cake repertoire for years to come. And then I sampled a second, a third and a fourth bite just to be really, really certain. 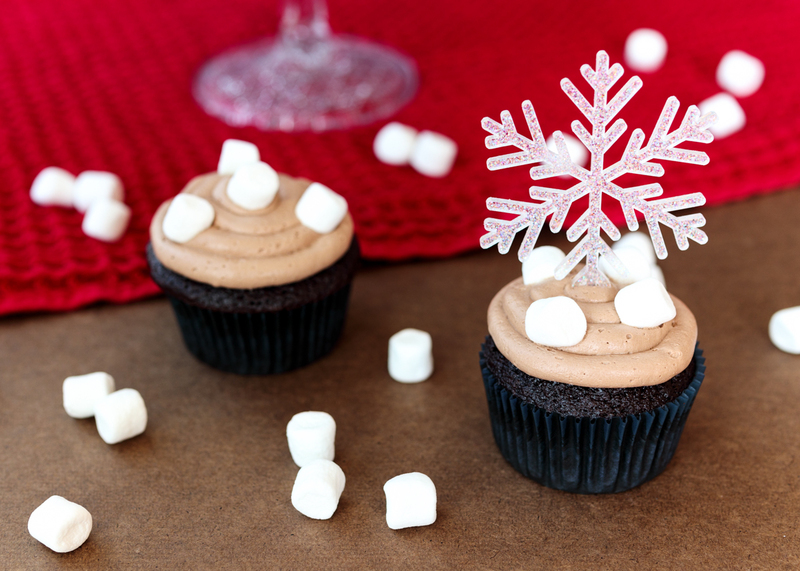 Cocoa powder and marshmallow fluff help give this buttercream frosting that classic hot chocolate taste. There’s less powdered sugar than a traditional buttercream because we are using marshmallow fluff to sweeten the frosting and to make it, well, fluffy! Also because it wouldn’t be a perfect hot chocolate without marshmallows. Enjoy! Preheat the oven to 350 degrees F. Line two cupcake pans with cupcake liners so you have enough for 24 cupcakes. In a large mixing bowl or in the bowl of a stand mixer, sift together the sugar, flour, cocoa powder, baking powder, baking soda and salt. In a medium mixing bowl, whisk together the eggs, buttermilk, melted butter, vegetable oil and vanilla extract. Pour the liquid ingredients into the dry ingredients and mix together until smooth. Pour the hot coffee into the batter and stir until combined. The batter will be extremely liquidy. Divide the batter between the 24 cupcake liners, filling them slightly more than half full. Bake for 18-20 minutes, or until a toothpick inserted in the center comes back mostly clean. Alternatively, they are done when you gently press your finger on the center of a cupcake and it lightly springs back. I find mine to be done at exactly 19 minutes. Let cool in the pans for a couple minutes then remove to a wire cooling rack to cool completely before frosting. Beat the butter until fluffy, about 3 minutes, scrapping down the sides as needed. Add the marshmallow fluff, powdered sugar and cocoa powder. Beat until combined and fluffy, scrapping down the sides as needed. Pipe the frosting using a pastry bag (see note) and top with the mini marshmallows. To make your own buttermilk: pour 1 tablespoon of lemon juice or vinegar in a liquid measuring cup. Pour milk, any fat percentage, into the measuring cup until you have 1 cup. Let sit for 5 minutes before using. If you don’t want to use coffee you can use hot water, but the flavor of the chocolate won’t be as pronounced. You can use decaffeinated coffee if you prefer. The frosting recipe is written assuming you will be piping a generous amount of frosting on each cupcake. If you would prefer to simply frost with a knife then you can most likely halve the frosting recipe. I’m all about the easy desserts these days. You will understand why when you see the March cookies! 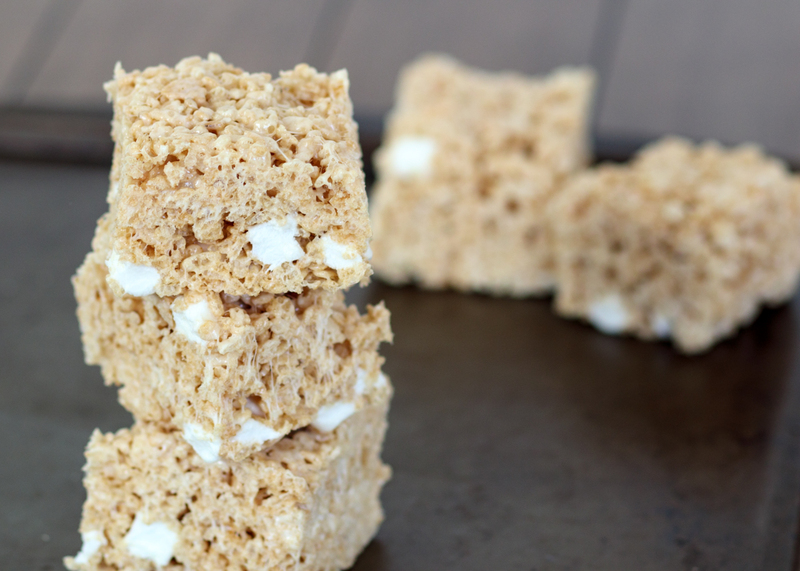 One of the best quick and no-bake desserts are rice krispie treats. Last February, I posted my Chocolate-Dipped Browned Butter Rice Krispie Treats, which are these same treats, but dipped in chocolate and covered in Valentine’s Day sprinkles. I decided that these treats are so crispy, gooey and full of flavor that they deserved their own post. I find normal rice krispie treats to be very bland. Good thing these aren’t normal rice krispie treats! If you’ve made my Perfect Chocolate Chip Cookies then you know how much rich depth of flavor browned butter can add to a baked good and these krispie treats are no exception. If you’ve never browned butter before it’s really simple. You melt butter on the stovetop and then continue to cook the melted butter over medium heat until it becomes golden brown in color, which takes about 4 or so minutes. You will be able to smell it as well; it will smell lightly caramelized and have you swooning. Rice krispie treats require melted butter anyways so it only makes sense to go that one step further and add some flavor to the butter. Typically when making rice krispie treats all the marshmallows get melted down, but I’ve left some mini marshmallows unmelted to create extra gooey pockets in the krispie treat. If we’re making a marshmallow treat we might as well go all out, right? Of course, if you really wanted to go extra all out you could take a cue from the Chocolate-Dipped Browned Butter Rice Krispie Treats. 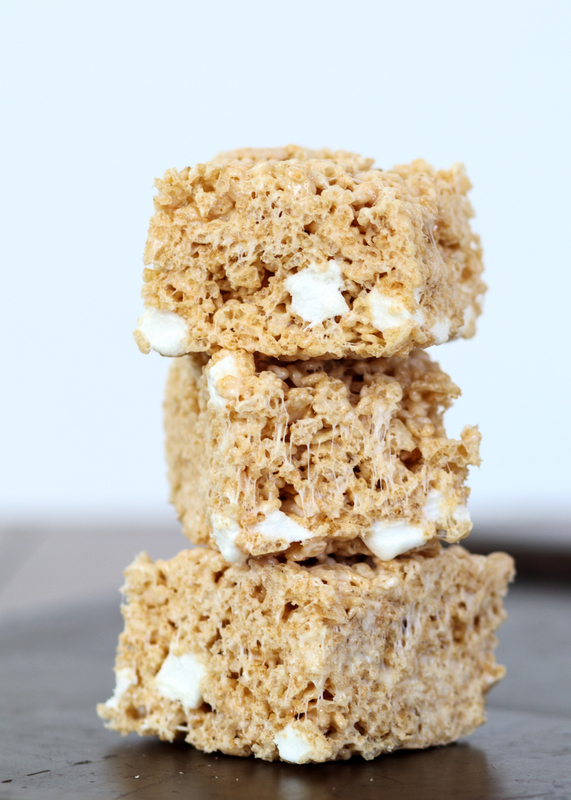 I’ll take either version, which is saying a lot about the flavor and texture of these Browned Butter Rice Krispie Treats since I’m so chocolate obsessed. If you really want to make people’s mouths drop, follow the directions below for the jumbo-sized krispie treats! 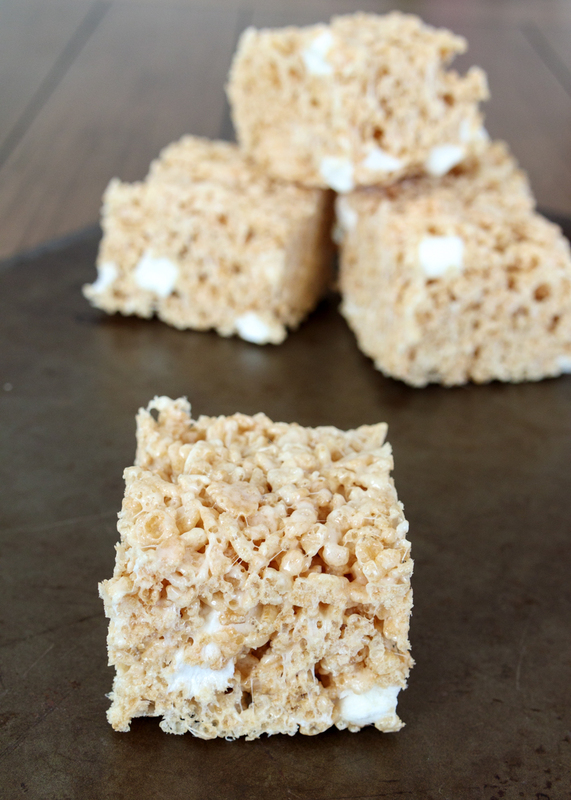 It makes a thick bakery style krispie treat like the ones pictured here that will have everyone thinking you bought them at your local bakery. Line a 13x9 pan or a 9x9 pan (see note) with nonstick aluminum foil and set aside. In a large pot big enough to fit all the cereal, melt the butter over medium heat. Continue to cook the butter, making sure to continuously swirl the pan, until the butter is golden brown in color, about 4 minutes. Lower the heat then add 4 cups of the marshmallows, stirring until melted. Remove from the heat and stir in the vanilla and salt. Add the cereal to the pot and gently stir until coated. Gently stir in the remaining ¾ cup of mini marshmallows. Pour the contents of the pot into the prepared pan and spread evenly. I used a small piece of wax paper to lightly press on the krispie treats in the pan to create an even-ish surface without pressing too hard (you don’t want the krispie treats to be dense). Let cool completely. 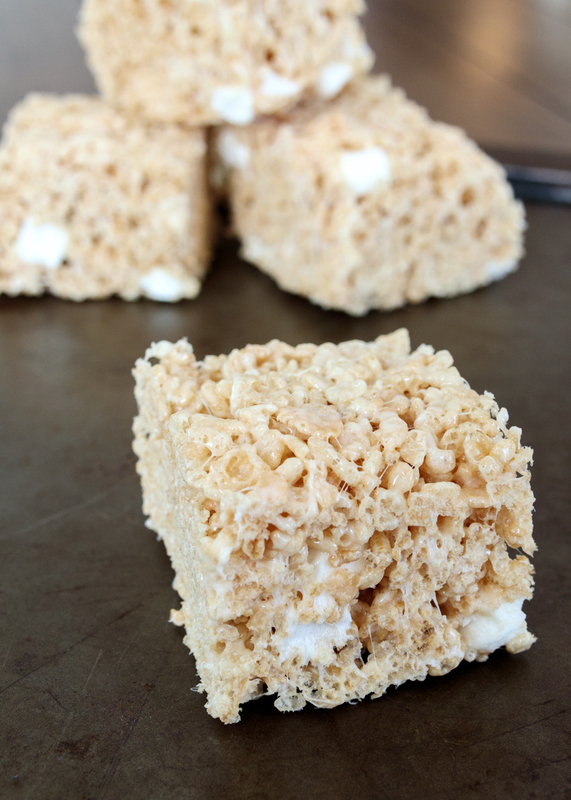 Once cooled, remove the foil from the pan and cut the krispie treats with a sharp knife. Store at room temperature in an airtight container. For 12 normal-sized krispie treats use a 13x9 pan. 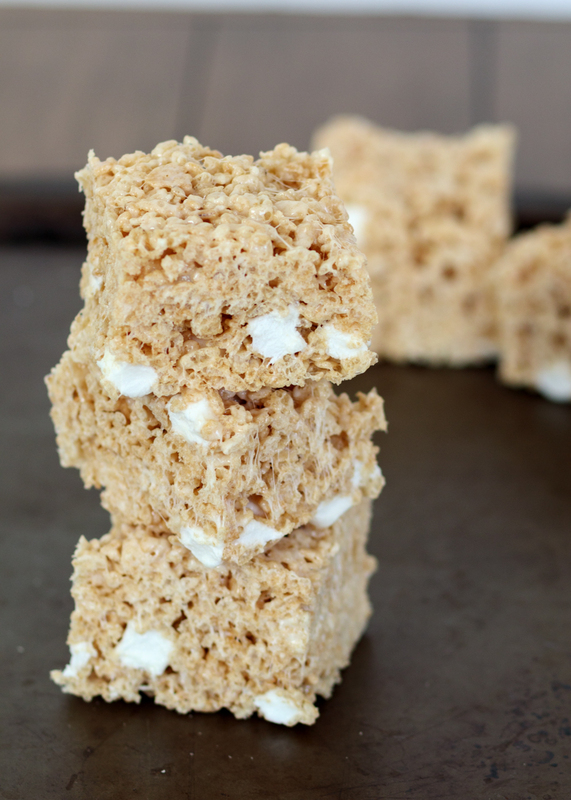 For 9 jumbo-sized krispie treats use a 9x9 pan. The krispie treats stay for a few days, but they taste best the same day.